"Teaching life-long computer skills in our schools offers further benefit in that it gives students insights that they're unlikely to pick up on their own. In contrast, as software gets steadily easier to use, anyone will be able to figure out how to draw a pie chart. People will learn how to use features on their own, when they need them -- and thus have the motivation to hunt for them. It's the conceptual things that get endlessly deferred without the impetus of formal education." Gary Martin, whose reasonably-priced subscription-based Phrase Thesaurus is worth a close look, also runs a free companion Phrase Finder site, with the meanings and origins of over 1200 phrases and sayings. The latter is successfully funded by advertising. Developments at Blackpool and the Fylde College. Guest Contribution from Christine McAllister. Christine McAllister is Head of Learning Resources at Blackpool and The Fylde College. After years of struggling to interest academic staff in the potential of learning technology, Moodle seems to have made all the difference! At Blackpool, we have been lucky enough to retain e-Learning Champions for each academic department – they each get 3 hours per week off their teaching timetabletimetable. Over the past few years, this has been a relatively stable group working first with Learnwise and then with Moodle. This is our second academic year with Moodle and all Schools are engaged with it. In some Schools, all courses have a presence – in others it is limited to particular courses. Each School uses Moodle in different ways, some more heavily involved in the content side of courses (including NLN materials), others using reflective logs and communication tools. There is a lot of interest in using video and some interest in sound. At the end of last year, I organised a very simple staff development event where each School had a slot with a cross-section of e-learning Champions in order to share good practice across the college. I have never run an event which generated such positive feedback! Yes, there were some dissenting voices but the vast majority of staff all said the same things – yes, I can see the point of this, yes, this will help me. We are now building on this to run a major e-Learning Conference for upwards of 500 staff in May of this year bringing in top level speakers from both HE and FE across a range of e-learning-related topics. I hope this will also feel like a celebration of how far we have some as a college. This year we have won an Association of Colleges "Beacon Award" for our Beauty Therapy provision. This was related to our Moodle use; and we also received high praise from Ofsted in relation to our Teacher Education, and Engineering and Computing provision. There is now an interest in the college in developing multimedia materials and a possible interest in running some courses fully or partially online. We find that there is more development work done on the Moodle system than with any commercial systems that we have experienced. We were prepared to buy in external maintenance but we have never needed to. So – there are lots of good feelings around Open Source Software as well as the product itself. In terms of staff support, the college has a full-time Administrator plus another member of staff who is more or less full-time on Moodle. Training has been done by one of the Learning Resources staff on a half-time basis. 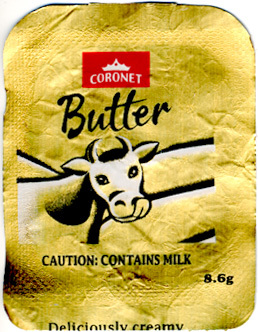 You get the feeling that the graphic designer of this absurdly worded foil top for a butter punnet decided that the safety warning required a particularly sinister looking cow. "The brain is a machine with limited resources for processing the enormous quantity of information received by the senses. As a result, attention is extremely selective and the brain must rely on all sorts of shortcuts if it is to cope effectively." "Teachers/designers can adopt two strategies to reduce the risk of learners experiencing cognitive overload: provide less information (quantitative approach) or take much more care about how this information is communicated (qualitative approach)." JISC Online Conference: Innovating e-Learning 2007. Guest Contribution from Geoff Minshull. Last March, the JISC ran a highly successful online conference, Innovating e-Learning. This was organised by Direct Learn, on behalf of the JISC. It was a five day conference, and had over 400 participants, with over 2000 posts during the event. Presentations included two videos, 14 PowerPoint presentations (some with audio and/or video), 23 Word/PDF papers, four web sites developed for the conference, etc. Presenters included Diana Laurillard, John Stone, and Stephen Heppell. After the conference, Diana commented that it was a "fascinating experience - well worth it from my point of view, as I got lots of good challenges, and much more depth of discussion than would normally be managed at a keynote. Lots to learn, but clearly the beginnings of a great new way of doing conferences". Online conferences are an excellent way of sharing and disseminating information. Whilst not always free, they are invariably much cheaper than the physical equivalents, and, more importantly, the quality of the discussions is often better. The asynchronous environment allows for much more careful thought to be put into contributions, and makes it easier for many people to contribute, unlike live sessions where active participation tends to be more limited. Also, the quality of discussion can often be higher than you might find in a physical conference. The discussions and the presentations will be available to delegates for at least one month after the conference ends on the 14th, to give people time to catch up with everything that happened during the conference - there is always a lot going on, and it can be difficult to keep up with everything over the four days of this event, so the persistence of information that you get in an online conference is really important for delegates. Have a look at the conference web site, and please do respond to the open call. From time to time I've covered developments at Epic, the Brighton-based e-learning company; and in July 2005 Epic published an e-interview it did with me. Epic has now started an ambitious business blog, which flatters me with a link, as well as taking a tough line on e-learning patents. Later this year Epic says it will start an e-learning wiki. Finally it looks likely that the company will make its well-regarded white papers freely available on the Internet. June 2003 Epic Group White Papers. e-Learning Standards: what global governance model is needed? Guest Contribution from Mike Collett. There are several business and intellectual property models for the development of standards and specifications for e-learning. obtain documents and to re-use them. Active organisations include ADL, AICC, ARIADNE, CEN/ISSS WS-LT, DCMI, IEEE LTSC, IMS, ISO/IEC JTC1 SC36 and SIFA. There are also lots of local and national standards organisations such as BSIIST43 in the UK. Though they tend to share their love of acronyms, each has a different model, a different jurisdiction and a different level of international involvement or uptake. They are competing, sometimes aggressively, in an overcrowded and confusing standards and specifications "market". How can these models co-exist and the organisations work together? A free conference is taking place in London, UK on March 19th to consider some of these issues. In particular it will consider the governance or stewardship of SCORM (Sharable Content Object Reference Model), as it is transitioned from its creators to its new international steward. Be part of the debate – submit a paper for the proceedings (by 16th February), offer to help or just register to come along. Mike Collett - mike [AT] schemeta.com - is a director of Schemeta and is Chair of BSI's IST/043 Committee. David Miliband, Secretary of State for Environment, Food & Rural Affairs, is unusual in having a frequently updated, and from the tone of it, personally written, web log. So you could imagine this making Government spin-doctors a bit jumpy. The comments on Milliband's 2/2/2007 post about the decision to distribute The Inconvenient Truth are i) numerous, and ii) mainly positive; and there is enough in it of general interest to make it worth subscribing to its RSS feed. There are more good web logs than you can hope to keep tabs on. One of the ones I do not look at often enough is John Mayer's CALIopolis. (John runs CALI, a long-standing consortium of US law schools that research and develop computer-mediated legal instruction and support institutions using technology and distance learning in legal education.) I enjoyed two recent pieces by John [I - FOR - 28/1/2007 , II- AGAINST - 30/1/2007] concerning the case for, or not, banning laptops (or cutting internet access) in law school classrooms.